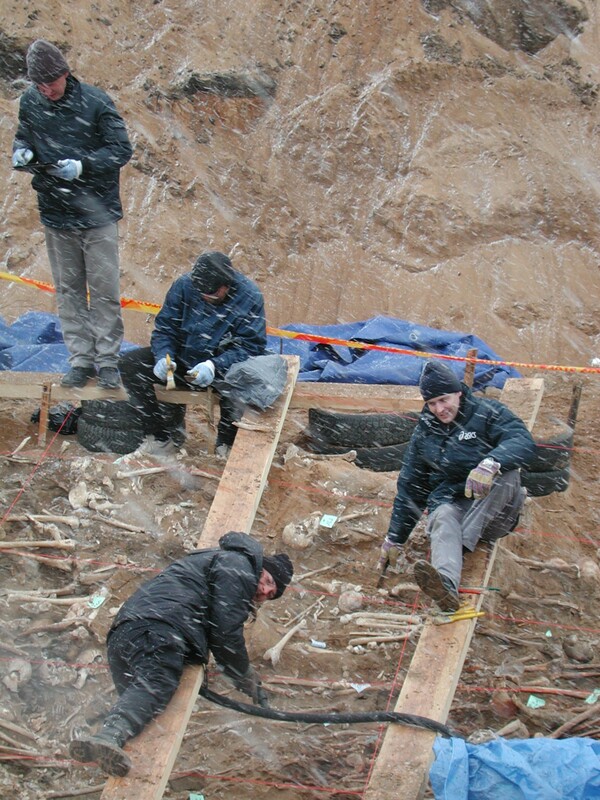 Skeletons Of Napoleon’s Soldiers Discovered In Mass Grave Show Signs Of Starvation…..
As snow lashed across their faces, archaeologists quickly excavated a mass grave in Vilnius, Lithuania. The jumbled bones, haphazardly oriented, were punctuated with finds of shoes, clothing, and armor. 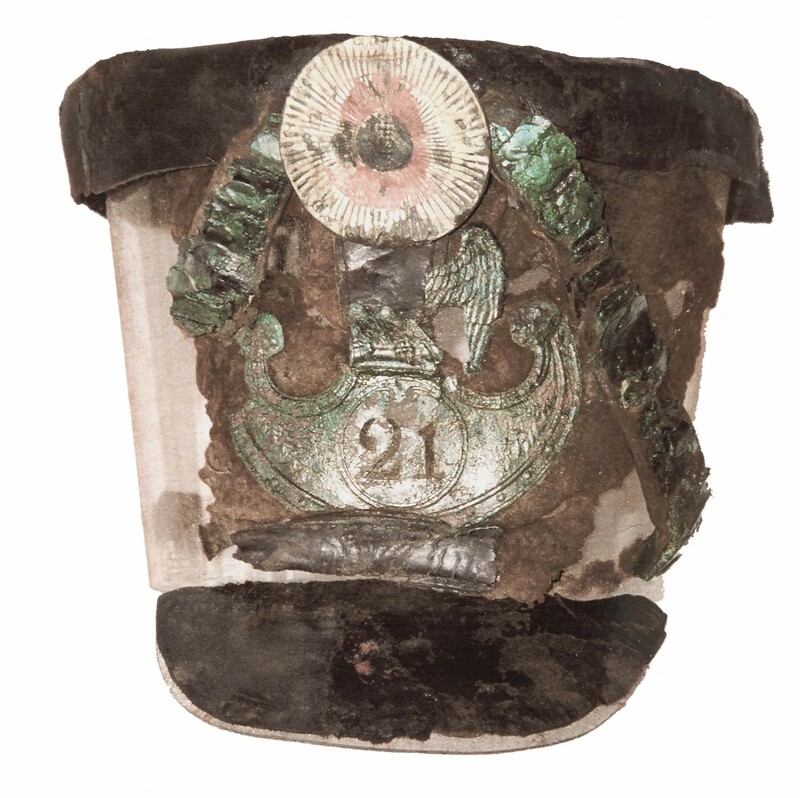 Buttons revealed the identity of the dead: over 40 different regiments were represented, all from Napoleon’s Grande Armée. Archaeologists had found the final resting place of over three thousand men who perished during Napoleon’s retreat from Moscow in 1812. Now, new chemical analyses of the bones are revealing where these soldiers hailed from and just how difficult it was to find enough to eat. Napoleon’s exploits are well-known from history. In an attempt to prevent invasion of Poland by Russian Czar Alexander I, Napoleon decided to invade Russia first. He started out with around 675,000 men who came from all over Europe; French, Germans, Polish, Lithuanians, Spanish, and Italians, however, made up the majority. This Grande Armée dwindled on its advance to Russia, then retreated when the czar refused to surrender and there were no supplies for the army in Moscow. By the time the army got to Smolensk, Russia, there were just 41,000 soldiers remaining. Charles Minard, a 19th century engineer who pioneered the creation of infographics, famously depicted just how treacherous this campaign was and what the loss of life looked like. Figurative Map of the successive losses in men of the French Army in the Russian campaign 1812-1813. Drawn up by M. Minard, Inspector General of Bridges and Roads in retirement. Paris, November 20, 1869. The Grande Armée continued west, crossed the Beresina River, and arrived in Vilnius. But there was little to eat there either. Around 20,000 soldiers died in Vilnius of hypothermia, starvation, and typhus. 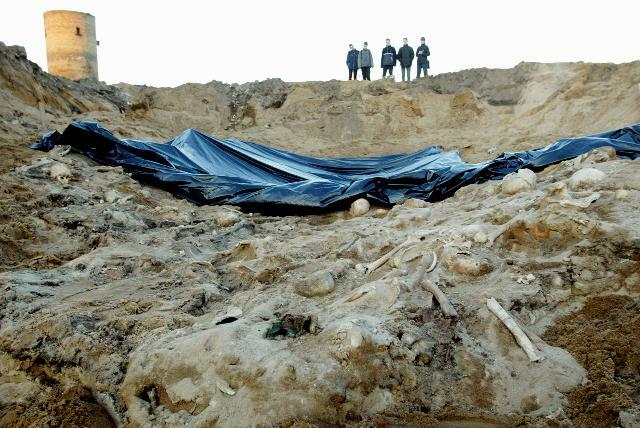 Corpses were thrown into mass graves. 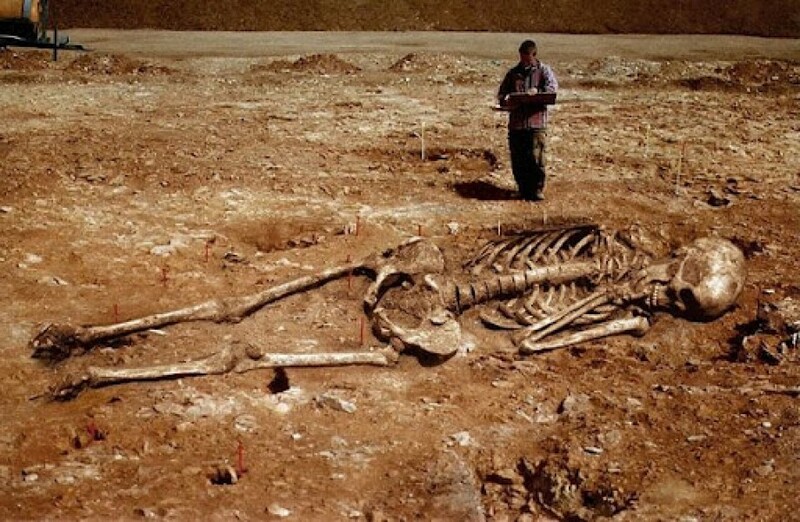 One of these, containing the remains of at least 3,269 people, was excavated by bioarchaeologist Rimantas Jankauskas and his team in just one month in 2001. Bodies were packed seven to a square meter, tossed in with clothing and other items. Based on the bones, archaeologists found that almost all the dead were males, with the exception of two dozen females, and that most were in their 20s at death. Two new research studies on these remains have attempted to answer questions about soldiers’ homelands and their diet leading up to their deaths. University of Central Florida anthropology students Serenela Pelier and Sammantha Holder, under the direction of UCF bioarchaeologist Tosha Dupras, performed stable isotope analyses on samples of the remains. Pelier used oxygen isotopes to find out the geographical origin of nine of the skeletons, while Holder used carbon and nitrogen isotopes to learn about diet and starvation. Pelier took samples from the femur of eight males and one female for oxygen isotope analysis. Oxygen isotopes in the biosphere vary depending on factors like humidity, distance from the sea, and elevation. By measuring the oxygen isotopes in human bone, it is possible to learn whether that individual was born in a particular geographic area. Pelier found that none of the individuals she tested had oxygen values that would be expected for Vilnius; no one was local. Based on the much higher oxygen values, they were more likely from central and western Europe, with three individuals possibly from the Iberian peninsula and one who may have participated in an African campaign before the Russian one. Additionally, the one woman who was tested may have hailed from southern France. 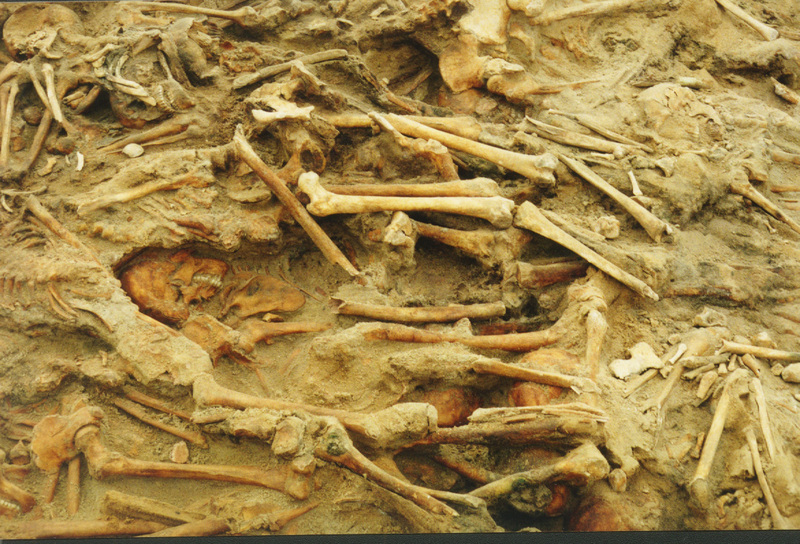 Holder also took samples from the femur of 73 males and three females buried in the mass grave, and she performed an analysis of the stable carbon and nitrogen isotopes in the bone. While carbon isotopes provide information mainly about the carbohydrate portion of the diet, nitrogen isotopes can give data on the protein component. Holder found that most of Napoleon’s soldiers were eating plants like wheat, while a few may have come from areas like Italy where more millet was consumed. The carbon isotopes did not hold any surprises. But Holder was much more interested in the nitrogen isotopes. More than two dozen of the people she sampled had high nitrogen values. Often, this is an indication that someone was eating high on the food chain, as nitrogen levels are higher in carnivorous animals compared to herbivores. Holder suspected, though, that something else was going on with these soldiers. When the human body is deprived of protein, nitrogen isotope values can skyrocket. So conditions like anorexia, prolonged morning sickness, vitamin D deficiency, and starvation can cause an increase in nitrogen signatures. Napoleon’s men were not in good health, even before their ill-fated stop in Vilnius. Research on the teeth of the soldiers in the mass grave showed rampant dental cavities and indications of stress during childhood, and over one-quarter of the dead had likely succumbed to epidemic typhus, a louse-borne disease. A febrile illness like typhus could cause increased loss of body water through urine, sweat, and diarrhea, which may also cause a rise in nitrogen isotopes. And, of course, historical accounts detail how troops fruitlessly scoured the countryside for food and how many of them ate their dead or dying horses. What caused the high nitrogen values among the Grande Armée? It could be the result of consumption of marine resources, from pathological conditions, or from starvation – or even from a combination of these. While the soldiers were not getting seafood from frozen Vilnius, I wondered about preserved fish and asked historian Max Owre, executive director of humanities at the University of North Carolina at Chapel Hill, about the provisioning of the army. “There was no large scale tinning of goods,” Owre says, which means that “it’s possible that soldiers could have carried saltied, dried cod, but more likely they were simply starving.” The carbon isotope values also help rule out seafood consumption, as they are more negative than the typical range for marine-based diets. This leaves illness or lack of food. Both Pelier and Holder tested the bones of women as well as men. But why would there have been women in a mass grave of Napoleonic soldiers? Owre told me that “there were plenty of camp followers as well as official woman cantinières and vivandières who sold goods to the troops. This woman from southern France would likely have been one of these or a follower. Some wives did tag along.” Finding the remains of women in this mass grave means archaeologists can add to the historical record, which largely glosses over women’s experiences in this war. Studies of the bones of Napoleon’s soldiers are key evidence in finding out what really happened in the Russian Campaign. Owre tells me that a large amount of pro-Napoleon scholarship places the blame for massive troop death on the cold Russian winter. But, he points out, “military logistics at the time were incapable of supporting an army this size, even considering that living off the land—stealing from locals—was the modus operandi of Napoleon’s armies and his enemies by this point.” If Holder is right that the elevated nitrogen signatures represent starvation, this “would be another piece of evidence for the failure of the Russian campaign,” Owre concludes. The members of Napoleon’s Grande Armée who perished in Vilnius in the winter of 1812 are now in a new burial location: the Antakalnis Military Cemetery, where they rest with other war heroes. Bone samples that have been preserved, however, may yet yield additional information about the short lives and tragic deaths of these young men and women. 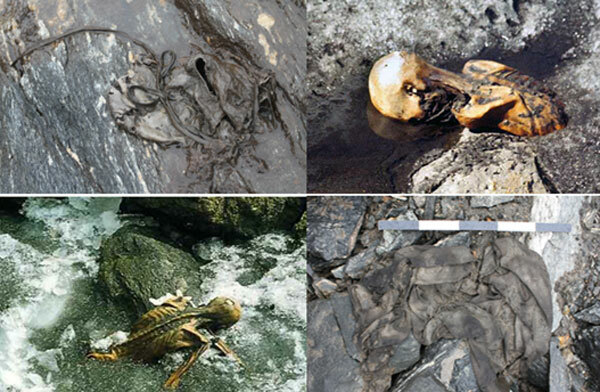 The race to retrieve ancient artifacts from melting glaciers……. Swiss scientists believe that only decades remain before areas that have been covered with ice for thousands of years melt away. The melting of the long-frozen snow and ice in the Swiss Alps, and elsewhere around the world, has already yielded numerous ancient artifacts, from hunting tools to goat-skin leggings, shoes, and Otzi the Iceman, the remains of a man who lived more than 5,000 years ago; and they are turning up with more and more frequency as the speed of melting increases. As part of the efforts to recover buried artifacts, a recent project run by a Swiss cultural institute encouraged alpine hikers to keep a look out for relics uncovered by melting glaciers and to turn over any items found in the Swiss National Park. In Switzerland and beyond, the booming field of glacier and ice patch archaeology represents both an opportunity and a crisis. On one hand, it exposes artifacts and sites that have been preserved in ice for millennia, offering new insights into our ancient past. On the other hand, from the moment the ice at such sites melts, the pressure to find, document, and conserve the exposed artifacts is tremendous. 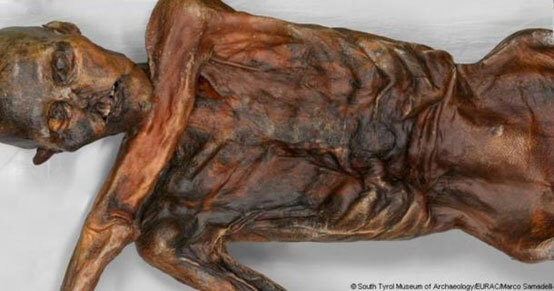 Ötzi the iceman is the famous ice mummy, who was discovered by some German tourists in the Alps in 1991 and was originally believed to be the frozen corpse of a mountaineer or soldier who died during World War I. Tests later confirmed the iceman dates back to 3,300 BC and most likely died from a blow to the back of the head. He is Europe’s oldest natural human mummy and, remarkably, his body contained the still intact blood cells, which resembled a modern sample of blood. His body was so well-preserved that scientists were even able to determine that his last meal was red deer and herb bread, eaten with wheat bran, roots and fruit. A DNA analysis showed him at high risk of atherosclerosis, lactose intolerance, and the earliest known human with Lyme disease. In 2006, a woodworker hiking near Lendbreen in Norway came across a well-preserved leather shoe, which incredibly, was last worn in the Bronze Age, some 3,400 years ago. 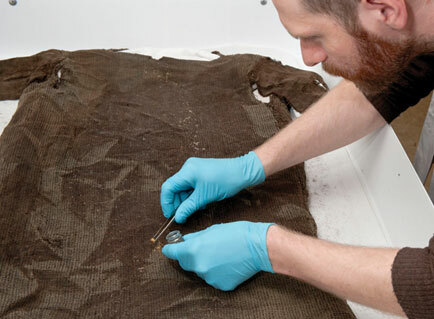 In 2011, another amazing discovery was made – a 1,700-year-old well-preserved tunic made of lamb’s wool. Among the items preserved in ice, fabric and leather are the most remarkable—and the most fragile. Wood artifacts may last a few years once they melt out of the ice, but for these items, the clock runs out much faster. Researchers have a week or less to recover leather before it dries out, becomes light and brittle, and blows away. The Swiss cultural institute is sponsoring the artifact retrieval project through the end of 2015 and will catalogue discoveries so that archaeologists can investigate them further. Monaco’s Prince Andrew to auction off Napoleon’s artifacts…. sell for as much as 400,000 euros ($500,000. Various items that once belonged to the famed French emperor Napoleon Bonaparte will be on auction this weekend, including his iconic hat. “I prefer to give a new lease on life to this collection of objects and relics rather than to see them remain in the shadows,” said Monaco’s Prince Andrew in a written statement. Monaco’s royal family, which owns the items, is auctioning them off in France and plans to use the proceeds towards refurbishing their palace. The items were originally collected by the prince’s great grandfather, Louis II, who was a big admirer of Napoleon. The collection includes typical items such as medallions, coins, keys, paintings and sculptures but some surprising pieces are also up for grabs including Napoleon’s old socks which are estimated to be worth as much as 5,000 euros ($6,230). As for the hat, it’s expected to fetch up to 400,000 euros ($500,000). Not all items are prohibitively expensive. Other items from his era such as small medals are estimated to sell for as little 100 euros ($125), allowing everyday collectors to get in on the auction action. Monaco, a sovereign principality, is one of the smallest countries in the world, measuring just under two square miles. It sits on the French Riviera and is bordered on three sides by France. Napoléon Bonaparte (French pronunciation: [napɔleˈɔ̃ bɔnaˈpaʁt], born Napoleone di Buonaparte; 15 August 1769 – 5 May 1821) was a French military and political leader who rose to prominence during the latter stages of the French Revolution and its associated wars in Europe. As Napoleon I, he was Emperor of the French from 1804 to 1814 and again in 1815. He implemented a wide array of liberal reforms across Europe, including the abolition of feudalism and the spread of religious toleration. His legal code in France, the Napoleonic Code, influenced numerous civil law jurisdictions worldwide. Napoleon is remembered for dominating European affairs (1799-1815) while leading France against a series of coalitions in the Napoleonic Wars. He won the large majority of his battles and seized control of most of continental Europe. One of the greatest commanders in history, his campaigns are studied at military academies worldwide. He remains one of the most studied political and military leaders in all of history. Napoleon was born in Corsicain a family of noble Italian ancestry that had settled in Corsica in the 16th century; they were not rich. He spoke French with a heavy Corsican accent. Well-educated, he rose to prominence under the French First Republic. His fame came as a military leader, especially in Italy, against the enemies of the French Revolution who were allied in the First and Second Coalitions. The ideas that underpin our modern world–meritocracy, equality before the law, property rights, religious toleration, modern secular education, sound finances, and so on–were championed, consolidated, codified in geographically extended by Napoleon. To them he added a rational and efficient local administration, and end to rural banditry, the encouragement of science and the arts, the abolition of feudalism and the greatest codification of laws since the fall of the Roman Empire. The Peninsular War (1807–14) in Spain and the his large-scale invasion of Russia in 1812 were major military failures. His Grande Armée was badly weakened and never fully recovered. In 1813, the Sixth Coalition defeated his forces at the Battle of Leipzig and invaded France. Napoleon was forced to abdicate and go in exile to the island of Elba. In 1815 he escaped and returned to power, but he was finally defeated at the Battle of Waterloo in June 1815. He spent the last six years of his life in confinement by the British on the remote island of Saint Helena. He was the great hero of the French people throughout the 19th century, and his nephew Napoleon III built on that fame to become ruler of France, 1848-70. 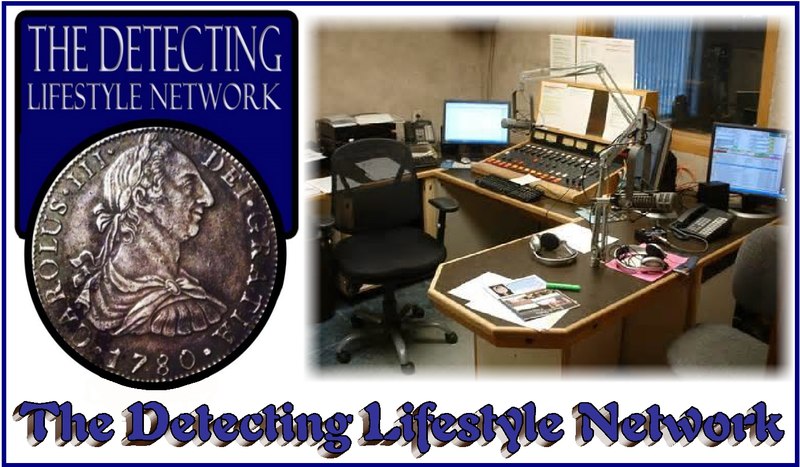 THE DETECTING LIFESTYLE T-SHIRTS ARE NOW AVAILABLE. Our Store is now open, follow the link below and click “product details” button to see all 10 colors that are available…ALL SIZES ARE THE SAME PRICE $15…sizes are from Small to 6X….